Victor Franco, Jr. is Vice President of Local Government Covering LA City, County and Southland Cities. 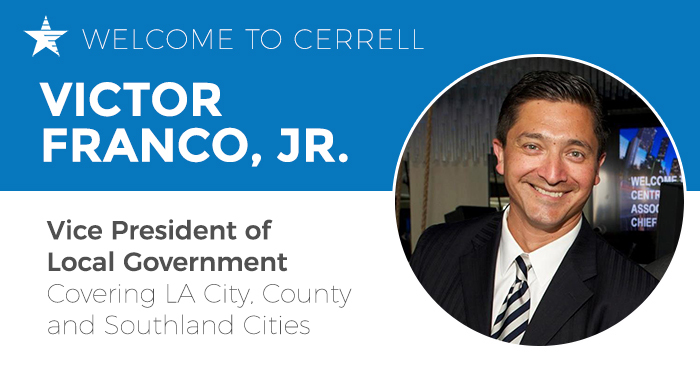 Bringing nearly two decades of government relations experience to Cerrell, Victor Franco, Jr. has joined California’s senior public affairs firm as Vice President focusing on Los Angeles City and County government, plus other cities throughout Southern California. Franco, Jr. will focus on the areas in which he’s excelled for years – development and land use, public safety, information technology and public health. Franco, Jr. previously worked at another advocacy firm and was also Senior Vice President of the Central City Association of Los Angeles. He also worked in advertising and marketing prior to his career in public affairs and served as a Congressional staffer in Washington, DC.